Florida Beach Targets Freezing Millennials with Eye-Catching Street Marketing – StratGo Marketing. Plug-in marketing department services. You might not think a well-known Florida beach would need to do much marketing, especially during this cold winter of 2015. But the professional tourism generators in St. Petersburg/Clearwater think otherwise. For 2015, the team at Visit St. Pete/Clearwater (VSPC, part of the St. Petersburg/Clearwater Area Convention & Visitor Bureau) has injected a healthy dose of creative street marketing. 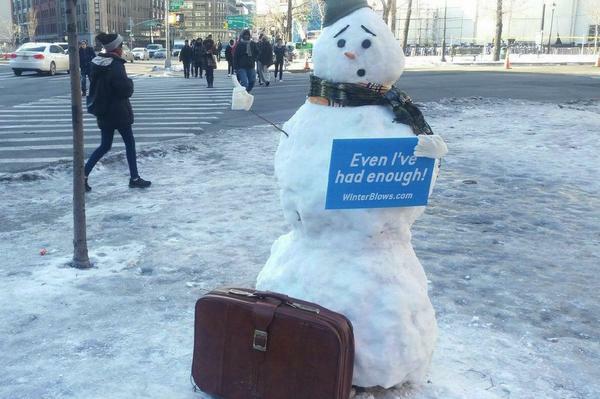 They’ve launched a guerrilla marketing campaign to target young travelers in New York and Chicago. Visit St. Pete/Clearwater 2015 marketing. Credit: Visit St. Pete/Clearwater via Tampa Bay Business Journal. The only identifier was the URL winterblows.com. That’s a landing page that directs visitors to a website titled liveamplified.com. The site has a contest for a free trip to St. Pete/Clearwater, plus info about vacationing in the area. The marketing objective was to reach and engage a new group of potential visitors, according to VSPC’s Executive Director David Downing. Downing elaborated on the guerilla marketing objectives in an interview with the Tampa Bay Times. “Make no mistake, the over-arching bulk of this campaign is our beach and sun and brand messaging. The buses, the subway trains, the elevators. * We are not abandoning that. In effect, we have enhanced that. * Tactics in the base marketing plan include subway posters, screens in office-building elevators, coffee cup wrappers with witty phrases, and urban street panels. Every business needs marketing, even a Florida beach during a brutal winter. Visit St. Pete/Clearwater created a clever guerrilla marketing program to target new millennial customers.